In Australia window tint is legal to use up to a certain darkness level. 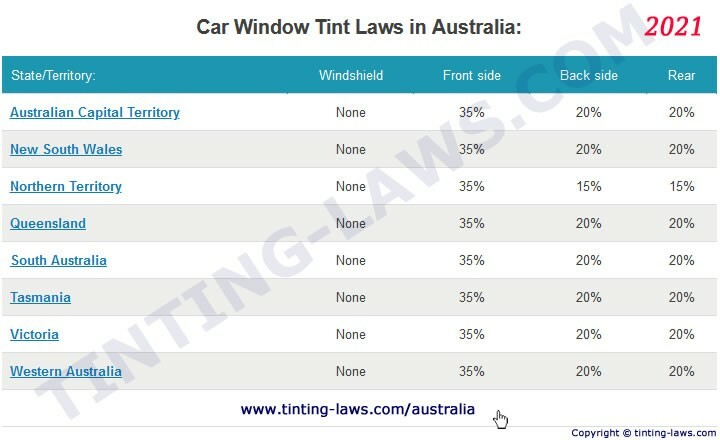 Most States and Territories in Australia have similar window tint laws, with the exception of Northern Territory and Victoria. This article will give you a brief rundown of Australia window tint laws for each region, and other regulations concerning these vehicle modifications. Australian Vehicle Safety Regulations allow all states and territories to set different limits for window tinting. Most territories have similar window tint laws, but certain regulations can be different. 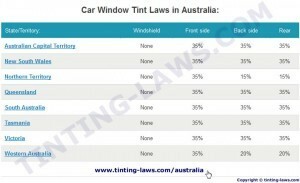 Table below provides a quick overview of Australian window tinting laws for each State or Territory. Make sure you click the links to see more detailed breakdown of all tinting laws! Data is current as of February 27th, 2019. There are more rules and regulations specified on our individual pages for each state and territory, and we strongly advise reading it. We also provide direct links to relevant laws or official documents where you can verify all information. You can also jump to: Australian Vehicle Design Codes, Jurisdictions, Penalties, Factory Tint, or our Conclusion for more general information on AU tint laws. Windshield: No tint allowed except uppermost 10% of the windshield. Front side windows: Must have more than 35% VLT. Back side windows: Must have more than 20% VLT. Rear window: Must have more than 20% VLT. Windshield: Only uppermost 10% of the windshield may be tinted. Windshield: Only uppermost 10% of windshield may be tinted. Back side windows: Must have more than 15% VLT. Rear window: Must have more than 15% VLT. Windshield: Only uppermost 10% windshield may be tinted. Windshield: Only uppermost 10% or 65mm of the windshield may be tinted. Back side windows: Must have more than 35% VLT. Rear window: Must have more than 35% VLT. Light omnibus (MD) – under 5.0 tonnes with 10 or more seating positions. NA, NB, NC, MD and ME are Australian Design Rules for vehicle categories stamped on vehicle’s compliance plate, found in the engine bay or next to driver’s seat. If you drive a van, truck, or even SUV check your vehicle’s compliance plate to confirm whether you can install darker tint. In case of these vehicles all windows behind the driver may have any level of window tint darkness, but windows next to driver must still have over 35% VLT. As previously stated each State or Territory within Australia may have different window tint laws. Make sure to comply with laws from vehicle’s registration area, or whatever area you use the vehicle most in. In case of certain jurisdictions where tinting laws are different, you may want to consider using car tint which is legal in both. It may save you from frequent traffic stops by law enforcement or additional hassle. We also always recommend contacting your local law authorities or Department of Transport and Main Roads (DTMR) to double-check any information we provide. If you live in NT where back windows can be tinted to 15% VLT, we still do not recommend it in case you travel a lot between states, or even in case you intend to sell your car in the future. You are legally required to remove illegal window tint when selling your vehicle. Exact penalties and fees for unlawful window tint vary for each state and territory. If caught with unlawful car window tint your vehicle may be deemed non-roadworthy and you will be compelled to remove any illegal modifications including window tint. Installing illegal tint may also invalidate your car insurance with certain companies as it can be considered an unauthorized vehicle modification and potentially a contributing factor to an accident. Furthermore illegal tint can even be used as evidence against you in court in case of a serious traffic accident. You must always ensure you only use legally permitted tinting. Majority of new vehicles are manufactured with tinted windows. Australia allows these windows (including windshields) to have up to 70% visible light transmission. It’s important to note this percentage is only allowed in case your vehicle or window was manufactured as such. Window film is an aftermarket modification. Most of these factory-made (OEM) tinted windows have 70% to 92% VLT. Total light transmittance value (VLT) includes both factory-made and aftermarket tint combined. In case your windows already have 70% VLT tint, installing aftermarket film with additional 65% would make them illegal in all of AU. Most Australian tint laws specifically don’t allow any non-transparent glazing installed on windshields. Australia Window Tint Laws. Feel free to share our image but please leave credits, thanks! Always ensure your window tint is legal. Never tint your windshields, and make sure you only tint with over 35% on side windows, and 20-35% VLT on windows behind driver. 35% is a significant level of darkness and anything lower can make it very difficult to drive at night, and vast majority of drivers will never have a need to tint further. Be sure to see our fabulous Tint Tester to preview how different VLT percentage appears! Considering we are very much familiar with tint laws in United States and some other countries, we consider Australian laws to be quite generous. Many countries do not allow under 70% VLT on front windows. Consider having a printed copy of relevant laws and tint film’s original packaging or certificate in your vehicle. It can often help you avoid unnecessary trouble with police officers. Lastly, always double-check any data with your local law enforcement authorities or directly with Roads and Traffic Authority in your state. Our information about Australia Window Tint Laws was last updated in 2018 and 2019. Our articles are constantly checked for accuracy by our partnered Australian traffic law experts, but in case any of our info provided is not up to date or correct be sure to contact us so we can fix it. Thanks!